5G cellular networks are supposed to deal with many challenging communication scenarios where today’s cellular networks fall short. In this post, we have a look at one such scenario, where Massive MIMO is key to overcome the challenges. Hence, the challenge is to provide ubiquitous connectivity in urban areas, where there will be massive user loads in the future: up to 200,000 devices per km2 is predicted by METIS. In their test case, each device requests one data packet per minute, which should be transferred within one second. Hence, there is on average up to 200,000/60 = 3,333 users active per km2 at any given time. Hexagonal cellular network, with adjacent cells having different colors for clarity. 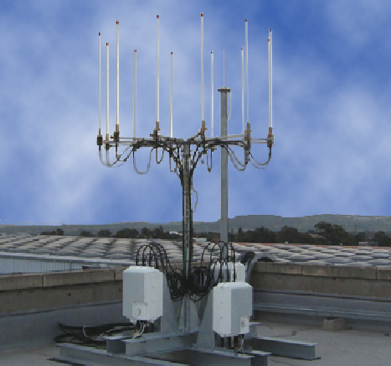 This large number of users is a challenge that Massive MIMO is particularly well-suited for. One of the key benefits of the Massive MIMO technology is the high spectral efficiency that it achieves by spatial multiplexing of tens of user per cell. 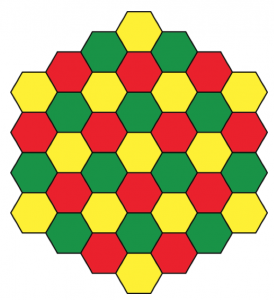 Suppose, for example, that the cells are deployed in a hexagonal pattern with a base station in each cell center, as illustrated in the figure. How many simultaneously active users will there be per cell in the dense urban information society? That depends on the area of a cell. 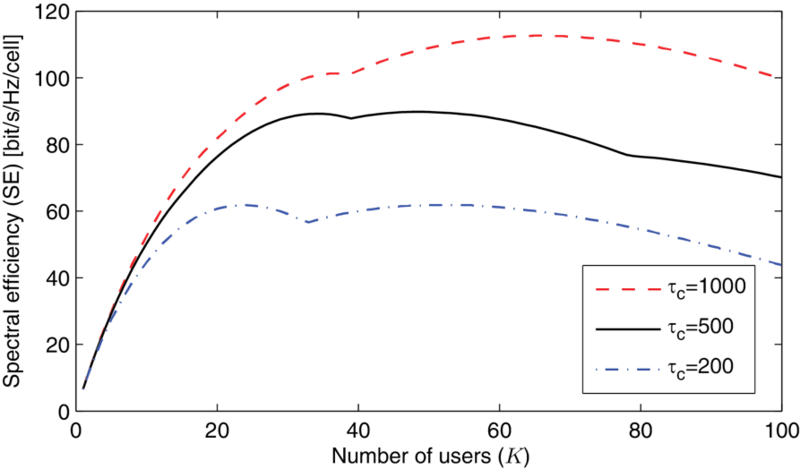 An inter-site distance (ISD) of 0.25 km is common in contemporary urban deployments. In this case, one can show that the area covered by each cell is √3×ISD2/2 = 0.05 km2. Recall that 1/60 of the total number of users are active simultaneously, in the urban information society test case. This gives the numbers in the second row of the table. From this table, notice that there will be tens of simultaneously active users per cell, when the user density is above 10,000 per km2. This is a number substantially smaller than the 200,000 per km2 predicted by the METIS project. Hence, there will likely be many future urban deployment scenarios with sufficiently many users to benefit from Massive MIMO. A fraction of these users can (and probably will) be offloaded to WiFi-like networks, maybe operating at mmWave frequencies. But since local-area networks provide only patchy coverage, it is inevitable that many users and devices will rely on the cellular networks to achieve ubiquitous connectivity, with the uniform quality-of-service everywhere. In summary, Massive MIMO is what we need to realize the dream of ubiquitous connectivity in the dense urban information society.